Inflammation is a prime contributor to many conditions our pets may suffer from, including allergies, arthritis, or diseases of the kidneys, brain, and heart. The good news is that one simple, all-natural supplement can combat all of these conditions at once! Nutramax Welactin Omega 3 liquid or softgel capsules help reduce inflammation in both cats and dogs, leading to healthier skin and coat while promoting overall wellness in cats and dogs. The easiest and most effective form of Omega 3 fatty acids for pets is high-potency fish oil from cold water fish. This concentrated form of Omega 3 is naturally appealing to both cats and dogs. It can be used as an ingredient in pet food and/or mixed with food as a supplement on a daily basis. Why do dogs and cats need Omega 3 fatty acids? As mentioned above, Omega 3 fatty acids can’t be produced by your pet’s body naturally and must be acquired through a food source. Omega 3 supplementation for pets has long been a favorite topic for pet care professionals and veterinarians. The benefits of giving your pet Omega 3 fatty acids can be seen and felt, as both cats and dogs will experience a softer, more luminous coat with fewer skin problems such as itching, irritation, redness and hot spots. Omega 3 supplementation also reduces inflammation caused by skin allergies from flea bites, topical contact with allergens, and food allergies. The benefits of Omega 3 fatty acids for pets are not just skin deep. This reduction in inflammation extends throughout the entire body, promoting overall wellness. Many diseases of the vital organs stem from chronic inflammation. Arthritis (inflammation of the joints), cardiac disease, liver disease and kidney disease may all be helped by Omega 3 supplementation. 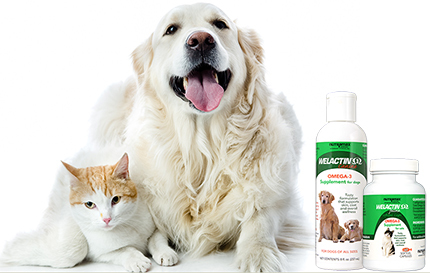 Lifelong Omega 3 supplementation for cats and dogs can help prevent inflammation-related diseases later in life. However, senior pets who haven’t been given Omega 3 fatty acids in the past can also benefit. Older pets being given Omega 3 supplements for the first time may see improvement in neurological and brain function, as well as all of the benefits mentioned above. Those who’ve slowed down due to arthritis and joint problems may experience improved mobility and exercise tolerance. Pet parents with senior pets that are being given NSAIDs (non-steroidal anti-inflammatory medications) should consult with a veterinarian prior to starting Omega 3 supplementation, as it may decrease blood clotting. The damage that inflammation does to vital organs like the heart, liver, brain, and kidneys is often preventable. Protect your pet against the ravages of inflammation with Nutramax Welactin Omega 3 Canine or Nutramax Welactin Omega 3 Feline. Supplementing your pet’s diet with this high-potency fish oil-sourced Omega 3 formulation is the perfect defense against diseases stemming from elevated inflammation. Both Nutramax Welactin Omega 3 Canine and Nutramax Welactin Omega 3 Feline are available as either liquid or softgel capsules, making it easy to choose the form that is best for your pet. Give to your dog or cat each day either directly by mouth or mixed with your pet’s daily meal for a glowing coat and overall good health. If fishy dog breath is a concern, try Nutramax Welactin Omega 3 Canine Softgel capsules, which contain natural peppermint for fresher breath. No matter which form you choose, you can be sure you are giving your pet a high-potency Omega 3 supplement derived from quality fish oil to support the immune system while reducing inflammation. Add Nutramax Welactin Omega 3 to your pet’s wellness regimen for a silky, pettable coat and a healthy, active life at any age. Win FREE Nutramax Welactin Omega 3! 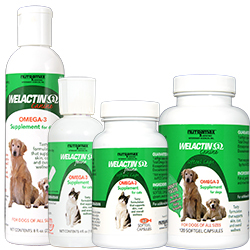 Does your dog or cat need Nutramax Welactin Omega 3? Just leave a comment below and you could win FREE Nutramax Welactin Omega 3 from 1800PetMeds! Two winners will be chosen at random on Tuesday, November 7, 2017, so everyone who participates has a chance to win! (Limited to residents of the U.S.) Good luck! Congrats to the drawing winners, Dianne H and Carolyn R. We’ll send you an email about claiming your prize. My puggie’s gettin’ old so I reckon this is somethin’ that might help him! Thnx for the shot at this. Our oldest dog (a mix chow, shar pei, terrier, and chuahuaya) is 13yrs and going on 14 yrs… still doing well and we’d like to see that he continues to live further. Based on our research, Nutramax Welactin Omega 3 seems to be just the thing to do that. Especially since he’s lived with us for 11yrs on purely Nutramax dogfood! My pup definitely needs to try this! Our Zira is a 9 year old beautiful red-coated dachshund who still acts like a puppy at times. She is constantly itching and scratching. It is mostly at her hotspot just above the tail and around the base of it. We do have a few fleas and are treating them the best we can. There is construction at our complex and every time we take her outside to potty, she winds up with a few more. All the fleas have been stirred up around here and it is a constant battle with them in our home. She would greatly benefit from this since she is allergic to the flea bites. She becomes a contortionist with her scratching by reaching around to chew the middle of her back! It really scares me when she does this because I am afraid she will really hurt herself. Dachshunds are not made to practically bend themselves in half! This would greatly help her and be a blessing to see her have some relief! Thank you! My two Golden’s would love to have silkier shinier coats. My lil girl has always had some skin issues … ladies we can sympathize! My boy just wants to look great in his old age! I want to give my cat the best healthy life possible… Nutramax. Do it for love. Would be Great to win for senior dog, fingers crossed. I own Senior Great Pyrenees that have arthritis now. Hoping to find a supplement that is a non-narcotic to help with the pain and inflammation arthritis causes. My young Lab, Babe, would love to have this as she has very dry skin and does a lot of scratching. Thanks for the chance to try it. We have 2 dogs and 3 cats. My 6 year old golden retriever has hip dysplasia and had his left hip done in 2014 and overdue for his right hip surgery. Our 17 year old rescue tomcat just passed away in August. My family decided we would like a kitten but ended up adopted 2 senior cats ages 10 and 12. Our Blue Tick is almost 2 and has skin allergies. We definitely have pets who would benefit from these products. I would love to win this product as I think it would be beneficial to lola,my 12 year old cocker spaniel. I Love the way Omega has helped my dog stop scratching so much. Been using this for years on our pets – great product! My lab is 13 and I think she could really benefit from this! A lot of people would have put her down with her skin and hip problems but we’ve been together since she was 8weeks and I would do anything for her! My best friend! Omega 3 liquid helped my senior Mastiff with his weight and skin problems. He’s acting more like his puppy self in a HUGH body!